The crackdown on the use of secure digital communications in many parts of the world is very concerning. Many governments, including those of Australia and the United Kingdom, are threatening to legislate backdoors for law enforcement in encryption standards, which would substantially weaken security for everyone while increasing the likelihood of damaging attacks from bad actors. Recently, Turkey arrested IT consultants for professionally imparting their skills and knowledge around technical matters to human rights defenders. Within this context, our pre-Internet Governance Forum (IGF) Disco-Tech event will highlight the work of six communities from around the world. 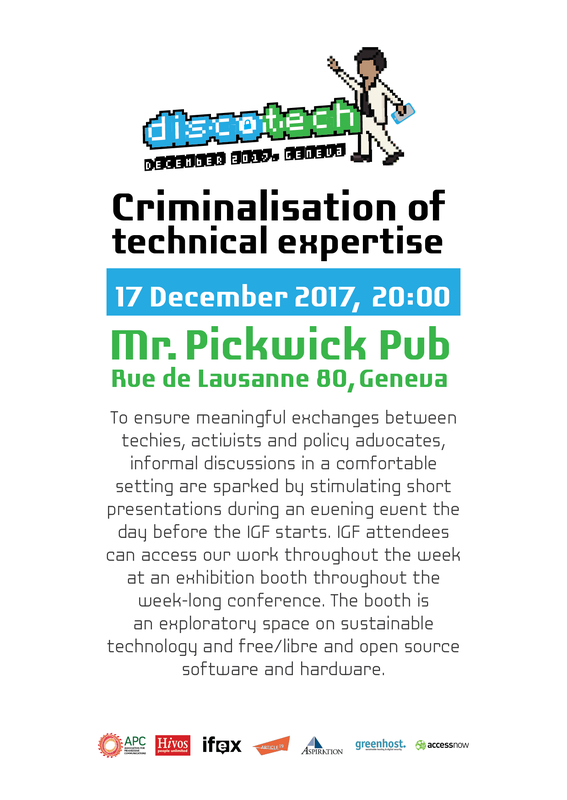 Hosted by APC, ARTICLE 19, IFEX, Access Now, Greenhost and Aspiration, our fourth annual Disco-tech event and party will focus on the criminalisation of technical expertise around the world, in an evening of lightning talks and demonstrations interspersed with dinner, music and drinks. Join us on 17 December, right before the IGF kicks off. Come early and stay late for food and a cash bar! When: 17 December 2017, 8:00 p.m through 10:00 p.m.
RSVP to mallory@apc.org or here.